Sir Frances Galton was not only related to Darwin he also did very similar research to Darwin. 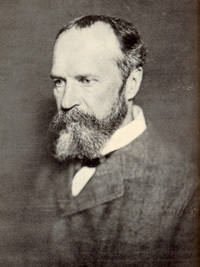 His most important contribution to modern psychology likely was through his efforts at quantifying behavior in addition to natural and physical phenomena (including the uniqueness of human fingerprints). Galton was the first person to really recognize some of the ramifications that Darwin’s theories had for understanding humans. He believed that intelligence was (largely) hereditary and that according to principles of natural selection, the most intelligent people should be the most influential in society even if their environment was not ideal; he thought that the most intelligent people were the most evolved. He was able to demonstrate that intelligence did appear to be hereditary by researching the families of eminent men and women. He estimated that preeminence occurred in about 1 in 4000 people but that people who were related to eminent men and women were more likely to be eminent themselves. He expanded on this method by studying twins (a common method for understanding heritable factors today). He demonstrated that, even when living in different environments, twins more often than not had very similar propensities. Galton really was the scientist who injected the ideas of evolution into the study of human behavior and attributes. Most intelligence testing today traces its roots back to Galton and his ideas of individual differences and heritability. Douglas Spaulding is considered the father of modern ethology, which is the study of instinctive animal behavior (Goodwin, 2005). Spaulding began his research of animals in the 1860s in France. One of his early experiments involved “blindfolding” baby chickens before they had any visual experience outside an egg and then leaving them blindfolded for at least a few days. After removing the blindfolds the chicks were able to peck at moving insects naturally as if they had never been without sight. Spaulding stated that this was instinct, an in-born and inherent knowledge of basic survival skills. Other chicks were temporarily deafened at hatching time. When the material stopping up their ears was removed they were able to run towards a mother hen at the sound of a cluck. Again, Spaulding stated that this was an instinctual behavior. Spaulding also observed imprinting; he stated that baby chickens will follow any moving object if it was the first moving object that they saw. Another ethological principle Spaulding proposed was critical periods. These are periods in which the development of a characteristic or attribute must develop. If it is delayed it will not fully develop. For example, if he stopped the hearing of chicks for too long (10 days or so) they would not respond to a call from a mother hen. If they were deprived of vision for too long they would not imprint and follow him. Developmental psychologists use the idea of critical periods (often called sensitive periods in humans) on which to base much research. Charles Darwin’s work has had a huge influence on the world, specifically in the sciences. While Darwin hypothesized and theorized many things some parts of his research were more salient to psychology than other aspects. Darwin wrote that humans and animals were descended from a common ancestor (this would develop into research in the 1900s and 2000s showing that humans and animals share the majority of their genes). Because Darwin stated that humans and animals have a lot in common, the field of comparative psychology (i.e., studying animals to learn about human behavior) increased in popularity. Scientists had studied animals for thousands of years and made inferences about humans from those animals but Darwin’s theories led to researchers making inferences about human behaviors such as learning, memory, emotions, and even social interactions based on observations and experiments with animals. Darwin’s research also led to research in psychology of individual differences. Before his theories, most researchers were trying to understand humans by looking at averages and similarities between people. They were just trying to understand the basic underlying constructs of human behavior. After Darwin, psychologists began investigating individual differences. It was not many years before the first modern intelligence test was developed by Binet in France. Intelligence is one area where many researchers focus on individual differences. Some psychologists are interested in what human traits make some people more successful than others. This is based largely on Darwin’s idea of natural selection where the strongest, adaptive, or creative species survive and other ones do not. Darwin’s theories also had a large impact on psychology in general; much of psychology today has strong biological underpinnings. This traces largely back to Darwin. Psychologists often try to explain psychological concepts in light of biological processes. Some schools of psychology are almost strictly Darwinian, such as ethological psychology (the most famous 20th century ethological psychologist is Konrad Lorenz) and evolutionary psychology. Even though Darwin was not a psychologist, his theories have had a large and lasting impact on the field of psychology. Ebbinghaus was the first modern researcher to systematically study memory. He was inspired in part by the work and writings of Fechner. Ebbinghaus was interested in associations (a philosophy or theory of the day that stated that people learn, remember, and organize concepts by ideas being attracted to each other in the mind much in the same way that physical objects are attracted to each other through the laws of magnetism or gravity. Once Ebbinghaus discovered the work of Fechner he started formulating ideas for research into human memory. He was still interested in associations but needed a way to experimentally research learning and memory. Ebbinghaus started using short nonsense syllables and serial learning to test associationism. He discovered that people (i.e., himself – he was his own and only research participant) could only remember about 7 of the nonsense syllables from a series when only being allowed 1 repetition. George Miller in the mid-1900s investigated this further and showed that humans can only hold 7 (plus or minus 2) words or “chunks” or information in active memory. Ebbinghaus was also famous for establishing a forgetting curve for newly-learned nonsense syllables. Without any relearning or repetition people quickly forgot learned stimuli (down to less than 40% retention within 1 day) but could still remember about 20% 31 days later. Ebbinghaus’ research of memory spurred the large field of memory research that we have today. Wilhelm Wundt is usually viewed as the first psychologist to set up an experimental laboratory. By doing so, Wundt was trying to establish psychology as a legitimate science, separate from philosophy. He wanted to show that researchers could have well-controlled psychological experiments and systematically measure human behavior. With his work he did not seek to rule out non-experimental aspects of psychology, he just tried to establish that at least some aspects could be measured in a laboratory. One key component of behavior that Wundt measured in his laboratory was reaction time, which he called mental chronometry. Wundt became interested in reaction time as a student of Helmholtz, who was the first to measure the speed of nerve reflexes. Wundt wanted to know how the brain related to basic nerve transit speed by testing reaction times. Wundt’s lab was able to incorporate the research of many scientists (including Donders’ subtractive method, which expanded on simple reaction times by establishing a reaction time baseline and then complicating the task by adding tasks) and use it to further our knowledge about psychophysiology. Wundt’s greatest accomplishment was the establishment of his laboratory, which not only produced a lot of research but also trained a lot of future psychologist researchers, many of whom came from America. These trainees went on to other universities and established their own labs; some much like Wundt’s but with what they thought were improvements. Now, psychology labs are ubiquitous on university campuses. Much of Wundt’s writings have not been translated into English, so we (at least outside of German-speaking countries) do not know the entire significance of his work. Fechner is considered by many to be the first experimental psychologist. It is more accurate to say that he was likely the first well-known and modern experimental psychologist. In any case, he was the first to publish a widely-read experimental psychology textbook. He was more than a writer though. He conducted a series of experiments investigating the nature of human sensation and perception. He even partially blinded himself by staring too much at the sun during studies about visual afterimages. His various studies solidified him as the premiere psychophysicist of the day. Fechner was greatly interested in applying mathematics to various bodily sensations and perceptions. He believed that he could accurately measure the workings of the brain by measuring the perceptions of the body. Fechner built a lot on the work of Weber, who formulated Weber’s law (jnd/S = k), a law that calculated the difference in the mass of weights required for a person to sense a difference. Fechner expanded on this by recalculating Weber’s law as S = k log R. Briefly the equation represented the relationship between sensation (S) and the size or mass of a stimulus. Like Weber, he believed that there was a threshold that had to be crossed in order to perceive a difference in sensations. Fechner was the first psychophysicist to talk about an absolute threshold, where a stimulus was first noticed. Once a stimulus was noticed, each “just noticeable difference” of the stimulus (i.e., each time, with increasing size or mass of stimuli, that a person can perceive a difference) was termed a difference threshold by Fechner. He also came up with experimental methods for establishing thresholds in laboratory settings. The method of limits is a method in which a stimulus is presented either above or below threshold and then decreased or increased, respectively, systematically to a point where it crosses the absolute threshold. So, Fechner is usually regarded as the first modern experimental psychologist (some of his methods are still employed today). He not only built on Weber’s law but also greatly expanded the field of psychophysics. Before Robert Whytt, little was known about human reflexes. Whytt was able to advance our knowledge through a series of experiments; he published the results in 1751. Previous scientists had noticed that decapitated animals (and people) still had muscle twitches. Whytt used decapitated animals to systematically show that he could make their muscles twitch by poking or pinching a leg. Clearly, basic reflexes did not require the brain. Whytt went beyond that though. He was able to dissociate reflex action from the brain by severing nerves between the spinal cord and an appendage. When the connection to the spinal cord was lost, there was no reflex. Whytt’s discoveries about reflexes went beyond simple automatic reflexes. He recognized that there was voluntary and involuntary action. The reflexes that he discovered the spinal cord played a large role in controlling were involuntary. He distinguished between voluntary and involuntary actions and stated that voluntary actions, if practiced enough, become habits. Habits, he stated, became more and more automatic with further practice. So while automatic and voluntary reflexes and actions are distinct they are not mutually exclusive. Whytt’s research was the forerunner to 20th century behaviorism, specifically classical conditioning. A number of years after Whytt published his work, two independent researchers Sir Charles Bell and Francois Magendie discovered the functions of the two main nerve tracts in and out of the spinal cord. While Bell receives a lot of credit, Magendie’s work was the more scientific and documented – Bell just had a lot of political sway. What did these two researchers discover? Magendie exposed the spinal cord of a live dog and severed the posterior verve tract. The dog could still move its limbs but had no sensation in the affected area. Magendie was then able to sever the anterior root of a nerve tract. He discovered that the animal still had sensation in the affected area but no movement. He put the findings together and stated that the efferent anterior nerves controlled movement while the afferent posterior nerves controlled sensation. Bell had earlier discovered essentially the same thing. The law about the functioning of the nerve pathways became known as the Bell-Magendie law. Neurologists and neuropsychologists have been able to use this law as the basis for understanding different types of central nervous system injury. The Age of Enlightenment was a time when many scientific principles and the methods for uncovering those truths came to light. Previous to this period, oppressive governments, ideologies, and religion ruled supreme in establishing Truth. Many people had to spend all of their time in activities related to survival and basic life. There was little time for and less encouragement of critical thinking. Many people were taught to accept the Truth as established by kings and priests. The Age of Enlightenment arose in this context of stifled ideas. The scientists and researchers who drove the Age of Enlightenment mainly developed their ideas and work not to discredit the church or governments but rather to show that truth could be discovered through objective, replicable means. Most of the scientists did not reject the teachings of the Church, except on scientific matters; they merely sought to establish objective methods for discovering truth independent of the church or government. Some of the scientists stood up for their observations and theories and were excommunicated (or killed) by the church not so much because they were refuting the teachings of the Church but because they stated that all Truth does not come solely from the Church. Galileo was one of the Enlightenists who spurred the age of science onward. He used systematic observations to observe the movements of the planets, the moon, the sun, and the stars. His precision and sound methods led him to say without doubt that the earth was not the center of the universe; in fact, it revolved around the sun. His teaching of heliocentrism offended the Church leaders and they excommunicated him and denounced his beliefs as heretical. The Church’s pronouncements would not stop the progress of science and scientific investigation. This scientific progress that was part of the Enlightenment continued on into the 20th century. The 19th century was a great time of scientific advancement. A lot of this advancement came through technology, which goes hand in hand with science. As science progresses, technology improves. As technology improves, it is often used in turn to advance science. One such scientist who advances science through technology and technology through science was Benjamin Franklin. Franklin through a series of experiments discovered a lot about electricity. He used this knowledge about electricity to invent the lightning rod. Through the invention of the lightening rod scientists were able to learn more about electricity and continue to advance science and technology.